I am always on the lookout for a primal baked good that still might taste good without adding honey, agave, or sweetener. Ive noticed that if you stop eating sugar for long enough, fruit starts to do a pretty good job at satisfying a desire for something sweet. It being blueberry season and all I decided Id try my hand at creating a coconut flour blueberry muffin that only uses the natural sweetness of fruit. Im always a little surprised when my baking experiments actually work. Well, friends, these work! Not only do they satisfy that baked-good craving that primal eaters may occasionally encounter, but they taste good, too. This proves one of two things. Either I am better at this baking thing than I thought, or you can throw any old mess of coconut flour and fruit in to a muffin tin and if its been long enough since you’ve eaten sugar, it’ll taste pretty good. You be the judge! Out of curiosity I conducted a nutritional breakdown over at Sparkrecipes. I discovered that these guys only have 98 calories each. I had yet to meet a muffin under 140 calories. I suppose it is the lack of sugar and oil in these muffins, neither of which is missed, that brings the calorie count so low. In case youre wondering, heres the macro data per muffin: fat 4.8 grams, carbohydrate 10.7 grams, protein 3.3 grams. 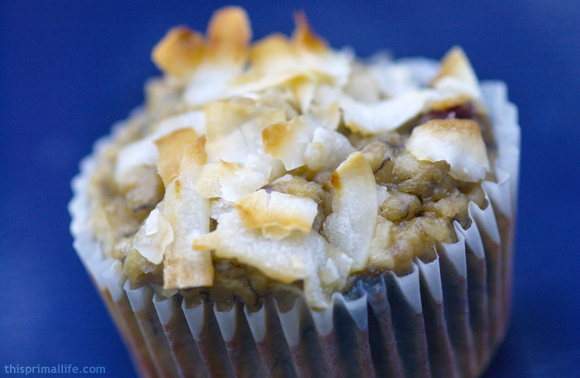 So, here we have it, a 100% primal grain-free, dairy-free, sugar-free coconut blueberry muffin. Enjoy! Mix coconut flour, baking soda, shredded coconut and salt in a large bowl, set aside. Beat eggs in a separate bowl and add mix in the coconut milk, vanilla extract, and mashed bananas. Add the wet ingredients to the dry ingredients, mix until well combines. Fold in blueberries. Divide into 12 muffins. Bake at 350 degrees for 25-30 minutes. Where do you buy coconut flour? For a mess of coconut flour and fruit, I have to say these were a treat. Honestly, sugar-free never tasted good to me before and here these muffins are actually good for your body. The primal diet is a book? Sounds fascinating–how does bacon fit into that? I am so glad you posted this recipe! I will definitely have to try this. Since I do not tolerate sugar very well I have pretty much given up baking for my kids. They really dislike my *experiments*. This is also made without nut flours so I can send these to school with them. To my surprise coconut is actually a fruit and not a nut. Oooh, these look fabulous. We eat primal/GAPS diet at our house, and so I’m excited to try these. Coconut and blueberries, my two favorites…. Hi Anuja – You should be able to find coconut flour pretty easily. I’m not sure if Kroger would have it but check Busch’s or Hillers. Whole Foods has it for sure. Look for a display of “Bob’s Red Mill” flours and baking stuff. Maureen – Thanks! There is a book called The Primal Blueprint and also a book called The Paleo Diet that differ somewhat but operate under the same general principle – which is that we can achieve optimal health by imitating the nutritional profile of our paleolithic ancestors. So, although one doesn’t need to start eating raw squirrel or anything, most westerners would be better off decreasing carbohydrates by eliminating grains and sugar and making fruits and vegetables the foundation of their diet. The word ‘diet’ is used in this context to indicate a way of eating, not a weight loss ‘diet’ – although a lot of people do lose weight this way. Bacon fits in as a protein and source of healthy fat. I don’t like to eat the fat on chicken or beef so much so bacon works great for me as long as I can get it without additives. Catherine and Dawn – So glad I could be helpful. If you end up making these, I’d love to know what you think. Very cool how they’re totally fruit sweetened! As a coconut addict, I’m definitely going to have to try these. As a note for folks, if you don’t have coconut flour handy, you may be able to get by with regular (unsweetened) shredded coconut, by running it through a grinder/food processor/etc. I’ve done this many times before, and it reduces the size of the shreds considerably. I found your site from the MDA contests. I made this recipe as written last week and really liked them. This week, I modified it a little and maybe liked it more. 🙂 I reduced the coconut flour to 1/3 cup, added 1/3 cup almond meal, and a few tablespoons of coconut oil. I also switched out raspberries for blueberries because that is what I had. I just baked these muffins. Although, I didn’t have coconut flour- so I “magic-bulleted” some up. The batter was very liquid and after 25 minutes in the oven, the muffins didn’t appear to set. I haven’t tried one yet, but they smell and look pretty tasty. I think I would have had better results with a store prepared coconut flour… oh well! Just curious, can you freeze these?